New Listing2011 Demon Knights #1 NM 9.0 Tony Daniel Cover! Demon Knights #1 2nd Print DC 2011 Bagged & Boarded VF+! 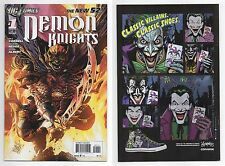 Demon Knights #2 & #5 Set of 2 Comic Books DC 2011 The New 52! DARK HORSE Comics THE IMMORTAL DEMON IN THE BLOOD (2011) #1 2 3 VF/NM +AUCTIONS! This page was last updated: 21-Apr 10:39. Number of bids and bid amounts may be slightly out of date. See each listing for international shipping options and costs.